Hello again! I've decided to start posting a mama/baby style post every now and then! I know a lot of you are way ahead of the game, but I figure it's better late than never.. and it's fun! You both look amazing! I wish I had the drive to actually dress up and look nice but that doesn't happen to much anymore considering I can't fit most of my clothes anymore lol. oh awesome! i'm glad you're doing this because i love your style! you both look so cute!! Super cute! 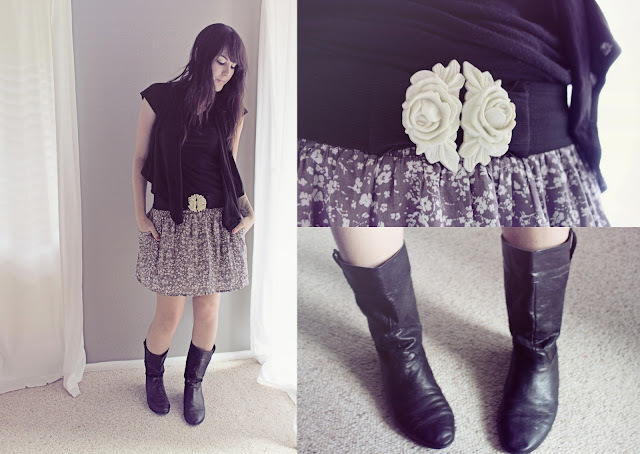 I love the skirt & belt! Jess, I'm so glad you decided to do this. You know since you are such a fashionable mama ;). You girls look FAB by the way ♥. Aww! I love this, you both look so beautiful! I particularly love your belt, super cute. adorable. im excited to have you be doing this! you are always dressed so cute! I love your outfit! And baby Ro's!! so adorable! LOVE both outfits! :) you two look fab! Perfect outfit. Flirty skirts with boots are my fave! And that beautiful baby of yours, I just love her! YAY! glad you guys like it.. i'm excited too!!!!! You both look amazing! My daughter has that set too, and it's one of my favorites! Love your blog!